Small-business owners are feeling better about the future -- more optimistic now than any time since the first quarter of 2008. That’s great news, since small businesses employ more than 50 percent of American workers. Small business has also been driving job creation during America’s recovery from the recession, adding more than 7 million jobs to the economy. At the core of the small-business engine are retail, service or product manufacturing companies launched with an initial investment of $100,000 to approximately $2 million. But who are these entrepreneurs and what makes them tick? 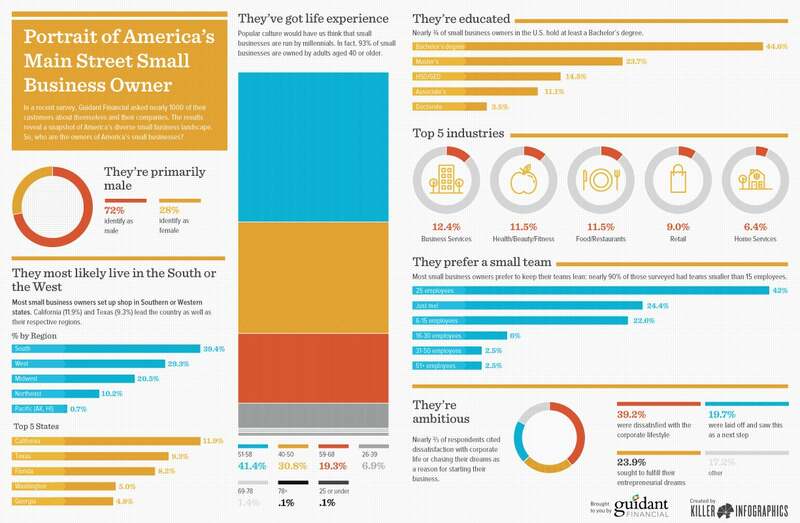 A recent survey through Survey Monkey of Guidant Financial clients who sought small-business financing finds that as a group, they are predominantly white (83 percent), male (72 percent) and college educated (71.8 percent hold a bachelor’s degree or higher). What’s more surprising is nearly 61 percent are age 51 to 68, indicating that baby boomers continue to be interested in entrepreneurship in significant numbers. Statistics from the Kauffman Index of Entrepreneurial Activity also echo this, reporting that the number of businesses started by those age 55 to 64 has risen 14 percent since 1996. What’s more, people in that age range start new businesses at a higher rate than those in their 20s and 30s. Ethnic minorities make up almost 15 percent of small business owners in the U.S., while women account for 36 percent. According to the Guidant survey, African-American, Hispanic, Asian and Native American entrepreneurs are skewing younger and with more education: 51 percent are age 50 or below, and 82.5 percent hold a bachelor’s degree or higher. The women owners in the study also trended slightly younger (43 percent age 50 or below). Veterans and retired military personnel represent 9 percent of all small-business owners, and are mostly male (90 percent) and older (more than 64 percent in the boomer generation, and another 6 percent age 69 or above). Main Street businesses are everywhere, with the highest concentrations in the southeast, west and Midwest regions. Business services, health/beauty/fitness, food/restaurant and general retail account for 44 percent of these businesses, but you’ll find these entrepreneurs working in every type of industry from child care to senior care, and home services to technology. Most Main Street small-business owners are entrepreneurs by choice, not because of loss of employment. They started their companies because of dissatisfaction with corporate lifestyles, or because they nursed a lifelong entrepreneurial dream. This is particularly true of women, who report higher numbers in both categories than men. Our study also reveals that Main Street entrepreneurs continue to feel vulnerable about financing, with only 20 percent of respondents indicating they have access to “enough capital.” Similarly, a CAN Capital Small Business Health Index found that 61 percent of small business owners find gaining access to capital a struggle. It’s still a challenging economic climate for entrepreneurs, but Main Street is holding steady. As one respondent reported, their greatest business success is the ability to thrive and “employ over 150 people during deepest recession in my lifetime.” Main Street entrepreneurs continue to be the spark that drives progress.